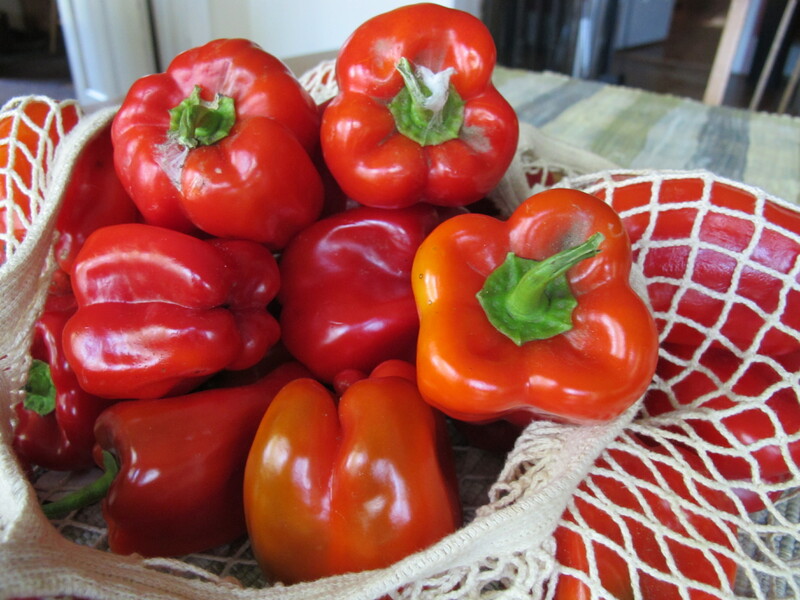 If you live in a spot like Michigan, organic red peppers are plentiful, fresh and reasonably priced just once a year. Since red peppers are frequently sprayed with pesticides and flown from countries I can only hope to someday visit, I like to preserve as much of this harvest as I can for use during the year. 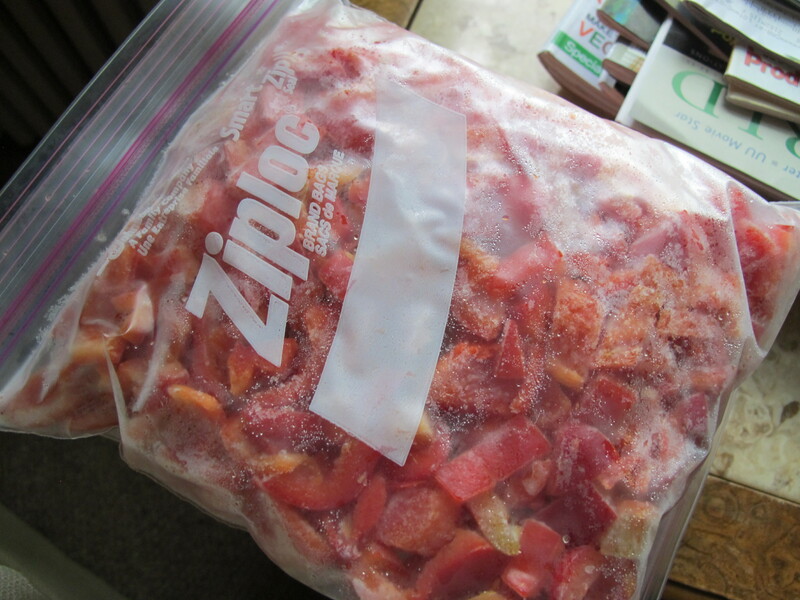 I an industrial food preserving technique–IQF (stands for individually quick frozen) to store as many organic red peppers as my freezer will hold. Here’s how I do it. 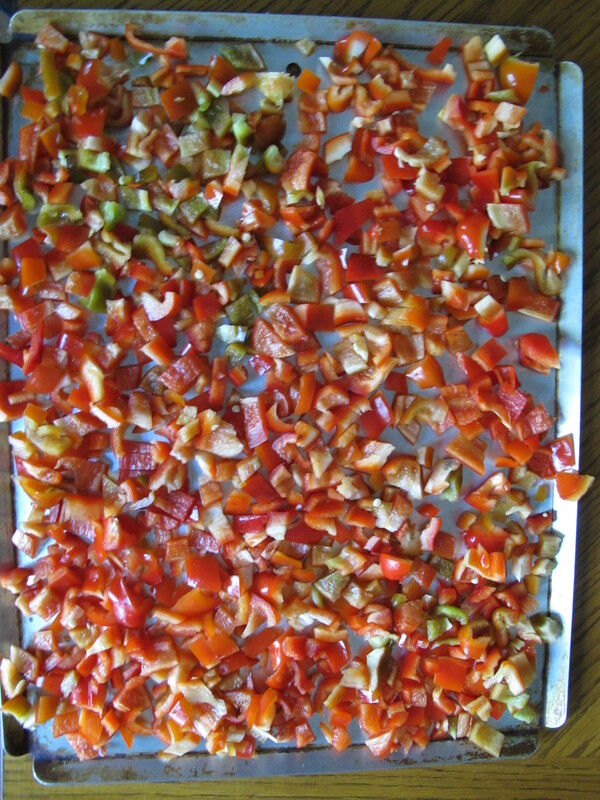 I rinse the peppers and set them on a towel to dry a few hours before I’m going to slice them. You want them to be as dry as possible when they hit the freezer. Core and seed your peppers, stripping away the pith as well. Cut one pepper into about four sections. Lay it flat and cut it into long strips. Then line all the strips up and dice them. Toss them onto a cookie sheet and spread them out in a single layer. Stick them in the freezer and freeze solid. When they come out, I use a pancake turner to detach them from the pan and scoop the diced peppers into a freezer bag. A one quart bag will hold 4-6 medium peppers. The peppers can be used in any dish in which they’ll be cooked–soups and sautes. I recommend using freezer bags over other containers because a little manipulation of the bag will allow you to break off the exact amount you want.